I stumbled across this quaint little Italian heavy metal band about a year ago and recently rediscovered in my massive music library (random play is a wonderful thing haha). I was like "hey let's post this!" 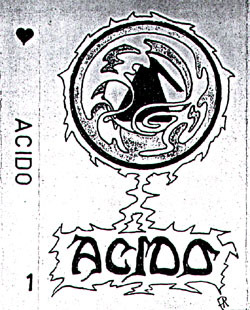 Acido is a fairly unknown 5 piece band from the mid to late 1980s. Released a couple demos in their lifetime, but unfortunately didn't go much further than that. A shame really for they had talent and an excellent sense of melody and song composition, though it's hard to know how their lyrics are as they are in Italian (which is pretty nifty! If any of my followers know Italian care to translate!). Lots of classic galloping riffs and epic solos here for heavy metal fans to feast on. The vocalist has a mid ranged raspy/gruff style that works really well. Old school metal fans will easily hear that they were fans of Dark Quarterer, as they definitely took that awesome sense of epic build and riffs that grow on each other. Again, it's too bad they didn't get a chance to at least record a full length, I could totally see that album being a favorite among metalheads. Oh well, this demo will definitely please folk! So today I've made it around the sun on this pathetic little planet 26 times without dying! Go me! A lot has happened in those 26 revolutions. Too much for me to jokingly list. Well, I suppose I should honor this special day with a post of 26. Much to my surprise, I found a song called "26 Years" which is perfect for this day. This band/project is a bit unusual and honestly not sure how I feel about it. 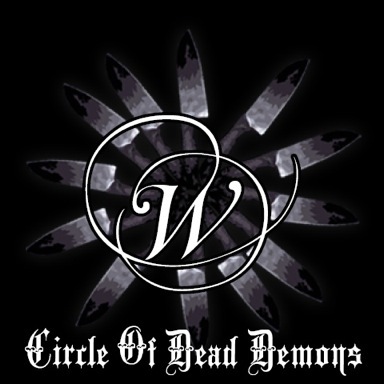 W. is a Christian themed death/grind/core solo band based out of Lockport, Illinois. Can't say I've run into many Christian death/grind bands, but that aspect isn't too prominent I guess. While it's not the best thing I've heard, this ain't bad. The riffs are chunky shredding at points death metal with the occasional deathcore like chuggy breakdown (which is slightly unnecessary cus the other riffs are impressive). I like the vocals which are guttural deep. The drums are clearly machine based, blasting like a grind band. Honestly there's better death/grind, but again you can do far worse and some might enjoy this! I know I enjoyed it enough to post it! 26 Years of being on this Earth is pretty worth it I think! MOTD - Firehouse: My Valentine's Day Gift! Man, it's been awhile since I've made a post! I apologize, but since there's no time like the present, let's get to it! Today is Valentine's Day! That wonderful day that celebrates love. Love is what brings us together today. Love is what causes two people to go to movies, make out in the seats until the staff bring in the air horn. Love is what causes CVS to sell out their chocolates. Love is what causes 80s hair metal bands to write super sappy songs that cause punks to explode with rage. For glam/hair metal band Firehouse, they have finally found the love of a lifetime! Firehouse was probably the last great glam/hair metal band before grunge took over the airwaves (some would say that they were indirectly responsible for grunge). Everything about their sound is perfectly cheesy and fun. Irresistible melodies, clean and sharp production, a powerhouse frontman, what's not to love (or hate) about them. And like all great hair bands, they had their signature ballad. This song is so sappy and syrupy, it's wonderful. Perfect for a day like today, so this is my Valentine's Day gift to you! I hope you all find your love of a lifetime!